ICICI Bank, the country’s largest private sector lender, registered a 10.2 per cent growth in net profit to Rs 2,922 crore for the quarter ended March, from Rs 2,652 crore in the corresponding period a year before, mainly aided by trading gain. This is its lowest profit growth since the October-December quarter of 2009, when the bank incurred a loss. Net profit numbers, however, were a tad higher than a Bloomberg estimate of Rs 2,881 crore. 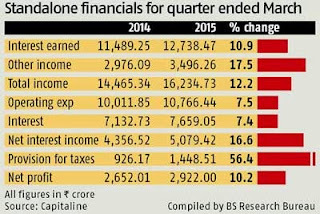 Bad loans zoomed, with more of restructured assets slipping to the non-performing assets (NPAs) category. Gross NPAs were at Rs 15,095 crore or 3.78 per cent of gross advances, as on March 31, compared with Rs 10,505 crore a year before. “We have seen higher slippages from the restructuring portfolio. The restructuring of loans was done on the assumption that economic activity will pick up but economic growth remained volatile,” said Chanda Kochhar, managing director and chief executive officer, explaining the rise in NPAs. However, she said, the worst was over and the addition to NPAs would come down in this financial year compared to the earlier one. The net restructuring book is at Rs 11,017 crore. The bank made Rs 2,033 crore of provisioning in the quarter. She indicated about 25 per cent of the restructured accounts had been downgraded, in line with the sector average. The restructuring pipeline is seen at Rs 1,500 crore. Treasury operations were the silver lining. The bank booked trading profit worth Rs 726 crore as compared to Rs 245 crore in the same period last year, on the back of favourable bond and equity markets. Trading gains helped non-interest income to grow 17 per cent; fee income rose seven per cent. The bank has seen healthy growth in retail loans, which is 42.5 per cent of the total portfolio; home loans grew 26 per cent and car loans by 25 per cent. Overall retail loan growth was 25 per cent, while the corporate book saw 10 per cent growth. Overall net interest income growth was 16 per cent. The growth in retail loans, coupled with 15 per cent growth in low-cost deposits, helped the bank to improve its net interest margin (NIM) by 11 basis points over the previous quarter to 3.57 per cent In Jan-March. For the full year, NIM was 3.48 per cent as compared to 3.33 per cent a year before. “Our endeavour will be to maintain the margins of the current levels (3.48 per cent),” she said. ICICI expects loan growth to improve and aims at a higher rate than the sector. “We might grow two to four percentage points higher than the system loan growth, at 18-20 per cent in FY16,” she said. Deposit growth is expected to be 15-16 per cent. ICICI Bank scrip on BSE closed 2% lower on Monday at Rs 302.